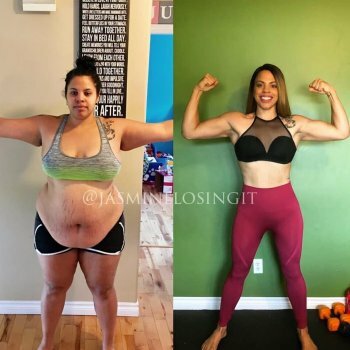 Jasmine's Winter Weight loss ! I lost 120 pounds in 2018 .. now I want to help YOU achieve your goals too! No, you only get money if you win! Your entry fee is your bet. You only get money back if you win the bet my meeting your weight loss goal. Hey everyone!!! We did it!!! Even if you didn't lose 4%, just remember we are ALL winners!! We are choosing to change our lives for the better! I'm so excited to say, I signed up for the next dietbet with Jasmine!!! Come on everyone... we've got this!!! We did it.!!!! On to the next bet good luck to everyone that will continue.! Amarilis and Kay Nicole like this comment. Wish we could win more on DietBet. I won $12.59 in this game. I paid $35 and didn’t get the membership this time. Oh well, least I won my money back! Jhere R. , Amarilis , Catherine M. and Victoria O. like this comment. What you’re actually wishing for is that more people don’t meet their weight loss goal which isn’t really sportsperson like. No, definitely wasn’t seeing it in that negative way as you are assuming. More like I wish DietBet would let us win a bit more. I see how it might have sounded bad, but honestly wasn’t my intention. Your game has now been finalized. Congratulations to the winners! You earned a 36.0% return on your money simply by investing in your own health. Don’t you wish all of your investments paid out at that rate of return? - Most Liked Player: Neli M.
- Most Generous Liker: Miranda H.
Jessica , Amarilis and 20 others like this comment. Catherine M. I received mine the very next day. Any update on how much the winners won? Great game everyone! I didn’t meet my goal, was1.5 lbs away but still lost 5.5 lbs overall. I am so happy to have found this game! Going to be signing up for another. Camece S. , Josie C. and 5 others like this comment. I paid $35... no $5 for membership. Anushila D. likes this comment. Put a 3x3’ piece of plywood under it. Sounds like your floor is uneven. This fixed my problem! And I have a new Bluetooth scale. More than likely it’s your floor. Great job on losing weight, it's hard with water weight swings. Keep up the good work. Just wanted to pop in one last time and say thank you everyone for being a part of my first ever DietBet as a host and as a contestant. I was surprised at how motivated actually seeing that goal number on my phone kept me ! I am definitely a firm DietBet believer now. I am especially inspired by everyones willingness to support complete strangers - the weightloss community really is phenomenal and I feel extremely fortunate to be a part of it - so THANK YOU AGAIN. I hope you will consider joining in on my next DietBet that starts THIS SUNDAY! "Spring in to Success!" Anushila D. , Ify and 66 others like this comment. When does the current game officially end? Jessiebess , Christine J. and 7 others like this comment. U will know once it’s finalized...it will be published on this page...! I won $12. 59 , since I paid $35 dollars. So $12.59 profit and I won my money back.